Any chance of Wiimote support? The Wiimote shows up as a normal Bluetooth device and can be paired. 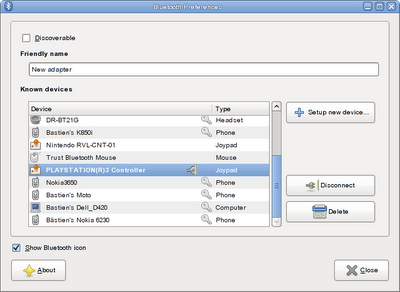 The support for it is already in the latest gnome-bluetooth. Does that make it usable as a HID? Is a joystick device node created? Just wanted to thank you for your work on this. Pairing PS3 joypads is one of the most wanted features of the crazy people installing Ubuntu on their PS3. Please make other posts about it when it gets accepted upstream (kernel, bluez) so that we can cherry pick the commits and help test it asap. Pepsiman: Seriously, why don't you just try it? I get "Pairing with Nintendo RVL-CNT-01 failed". The dialog is slightly different, but pairing fails in the same way. gnome-bluetooth 2.27.5 can pair with a Wiimote. Nothing useful happens while it is paired. I am developing an app that connects Sixaxis to PC through bluetooth. I never liked to have a patched hidd just to connect it. But having Sixaxis support out-of-the-box will be just awesome!